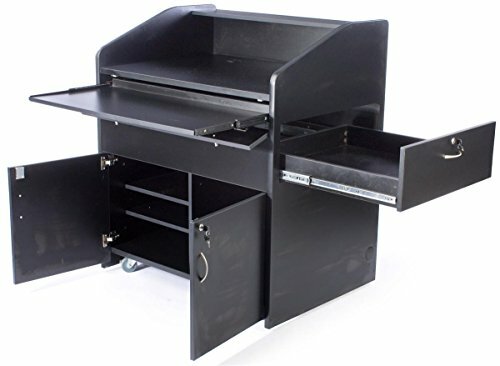 These lecterns for media equipment are designed to store everything you need for your presentations including laptops, computers, projectors, and audio equipment. The locking doors keep your equipment safe and secure. This lectern is constructed of 1-inch thick laminated MDF (medium density fiberboard) with rubberized edges to protect walls when wheeling the multi-media lectern from place to place. This lectern is designed to be durable and to last. Store and transport you're A/V equipment with ease with this multi-media lectern. Unit measures 41-inch (W) x 48-inch (H) x 30-1/4-inch (D), top desk working surface measures 39-inch (W) x 29-inch (D), sliding keyboard drawer measures 38-1/2-inch (W) x 12-inch (D), side drawer measures 24-1/4-inch (W) x 27-inch from front to back x 8-inch deep. Cabinet dimensions are 39-inch (W) x 18-1/2-inch (H) x 28-inch (D) adjustable shelves, 8 adjustments 1-1/4-inch apart, shelf height 5-inch (H) to 14-inch (H). Multimedia podium weights 280 lbs. Lecterns have locking cabinet with side drawer and keyboard drawer. Heavy duty casters allow this media cabinet to move with ease and lock to keep in place. Interior shelves are height adjustable. Cable holes throughout to keep your cables hidden and organized.